As you progress further through your senior years, you may find that you need an increased level of assistance in your daily life. This assistance may come in the form of higher-level aged care services at home or in a residential aged care facility. 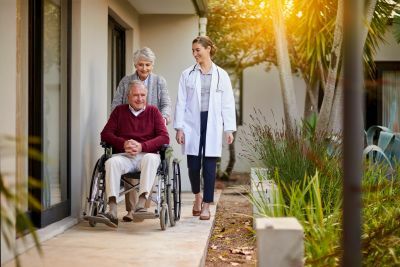 The choice of aged care service may be dependent upon the level of care you require as well as your personal preferences, for example, to receive assistance whilst residing at home or within a residential aged care facility. If you require higher-level aged care services, but would still like to stay at home then a Home Care Package may be an option for you. There are several things you need to consider before seeking help at home with a Home Care Package. For example, the type of service and eligibility, how to organise the services and the cost. There are no minimum age requirements to be eligible for the Home Care Package. However, you will need to undergo a home support assessment by the Aged Care Assessment Team (ACAT) or the Aged Care Assessment Service (ACAS) if you reside in Victoria. Level 4, support for individuals with higher-level care needs. Mobility and dexterity aids (and, assistance with their use) such as walking sticks, walking frames, bed rails, slide sheets, as well as mechanical devices for lifting. Continence management such as disposable pads and bedpans, as well as a catheter and urinary drainage appliances. And, more complex care with regards to nursing, allied health and other clinical services. On receiving the outcome of your ACAT (or ACAS) assessment, and being eligible for a Home Care Package, you are then placed in a national priority queue. Your position in the queue is based on the level of care you require, your current circumstances and the time you have spent waiting for care. While waiting it’s a good idea to have you or a family member research service providers in your local area as you will be able to choose your preferred service providers once approved. You can do this by using the My Aged Care’s service finder or calling My Aged Care on 1800 200 422. When you reach the top of the queue, you will receive a letter from My Aged Care with details of your Home Care Package. You’ll have 56 days in which to take this up and enter into an agreement with a service provider of your choosing. In some circumstances, this may be extended by a further 28 days if you’re having difficulty choosing your service providers. A basic daily care fee, which is 17.5% of the single person rate of the Age Pension. This fee applies to each individual receiving a Home Care Package, regardless of whether you are a member of a couple. An income-tested care fee. This is an additional fee payable, dependent upon your income. There are annual and lifetime limits, indexed each year, on the amount of income-tested care fee you may be asked to pay; the Australian Government will pay your relevant income-tested care fee upon reaching these caps. The income-tested fee may not apply if you are considered to be facing financial hardship. Fees for additional care or services not covered by your Home Care Package. You may wish to arrange a formal income assessment by the Department of Human Services after you have been assessed by an ACAT, so you know your income-tested care fee. A formal income assessment is not required if you are already receiving social security income support payments, as the Department of Human Services will already have your financial information. If you are not receiving income support payments and you choose not to have an income assessment, you may be asked to pay the maximum fee. For further information on the basic daily care fee and income-tested care fee, please read the ‘Schedule of Fees and Charges for Residential and Home Care (From 20 March 2017)’ document in our Downloads section. The purpose of the Home Care Package is to provide you with additional higher-level aged care services, on top of those delivered by the Commonwealth Home Support Programme, whilst you reside at home. It’s important to remember that aged care, like wealth accumulation and retirement, requires careful consideration and appropriate planning. If you or a loved one are considering aged care services, then book a time to talk to your financial adviser about the options available and how they may affect your financial situation. Please note: On 1 July 2014, the costs of Home Care Packages changed to make the aged care system more sustainable and affordable. If you received a Home Care Package prior to 1 July 2014, the new fee arrangements will not apply to you. However, if you stop receiving a Home Care Package for more than 28 days, the new fee arrangement will apply if you then commence a new package.